Please consider filling out the form below to support our ongoing marketing efforts – THANK YOU! 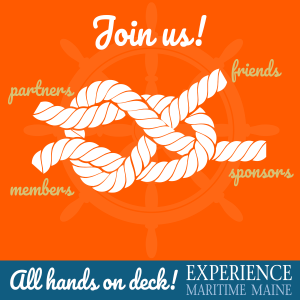 Experience Maritime Maine is a partnership of maritime-related organizations, businesses, and coastal communities working together to promote and preserve Maine’s unique maritime culture through heritage tourism efforts. Growth and development in Maine is critically linked to its 3,000 mile coastline. The working waterfronts, village centers, museums, lighthouses, archeological sites, waterways and islands, architecture, fisheries, and boatbuilding define its character. EMM markets and promotes Maine’s diverse coastal assets collectively through a unified, cross-sector approach that creates an engaging, exemplary visitor experience and a source of cultural pride for residents. Our website and social media serve as critical outreach tools to connect with current and potential visitors to Maine and with regional partners. 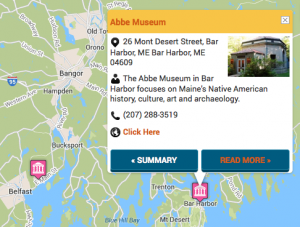 Our ongoing marketing activities include the creation of regular website content promoting Maine Maritime locations through blog posts, our year-round Maine Maritime Events Calendar, stories and suggested itineraries, and interactive map for visitors. We also reach out to our audience via our social media channels (Facebook, Twitter and Instagram), organize local events, and more recently produced a Maine Maritime Podcast Series (see Salts & Water: Stories from the Maine Coast). Position our selves to conduct another phase of Salts & Waters podcast development. Experience Maritime Maine is made possible only through the collaborative relationships and reciprocity between partner organizations that result in new and enhanced possibilities for civic participation and development of local leadership. Interested in becoming a Media Sponsor of Experience Maritime Maine? – please e-mail editor@experiencemaritimemaine.org. If you are sending a check, please note that the Penobscot Marine Museum is Experience Maritime Maine’s fiscal sponsor. Please make your check payable to “PENOBSCOT MARINE MUSEUM”.